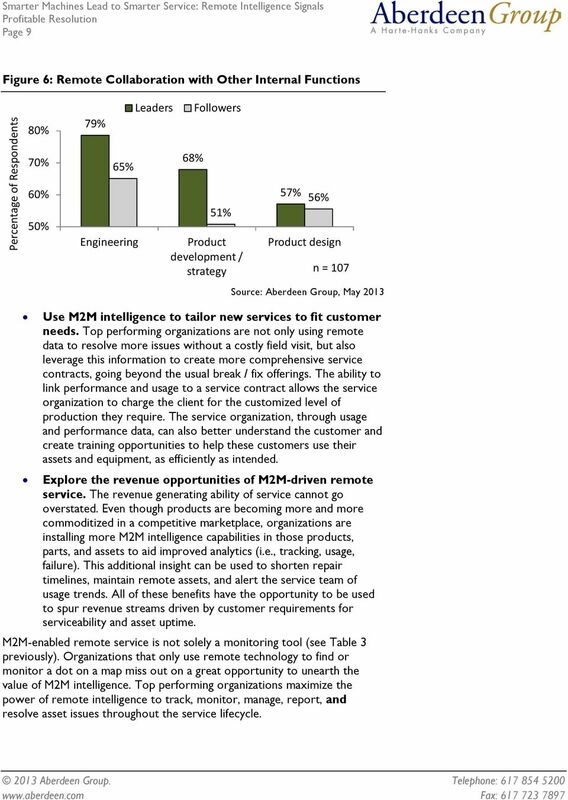 Download "Smart Machines Lead to Smarter Service: Remote Intelligence Signals Profitable Resolution"
1 Smart Machines Lead to Smarter Service: Remote Intelligence Signals Profitable Resolution The emergence of machine-to-machine (M2M) enabled equipment is driving a large growth of Field Service-based data and intelligence. However, the abundance of data at the fingertips of executives, front-line workers, and back office employees often times does not speed decisions or resolutions, but rather can paralyze action. Strategic use of this data can yield tangible benefits such as increased operational efficiency, creating more serviceable equipment, and other new product enhancements and service offerings. 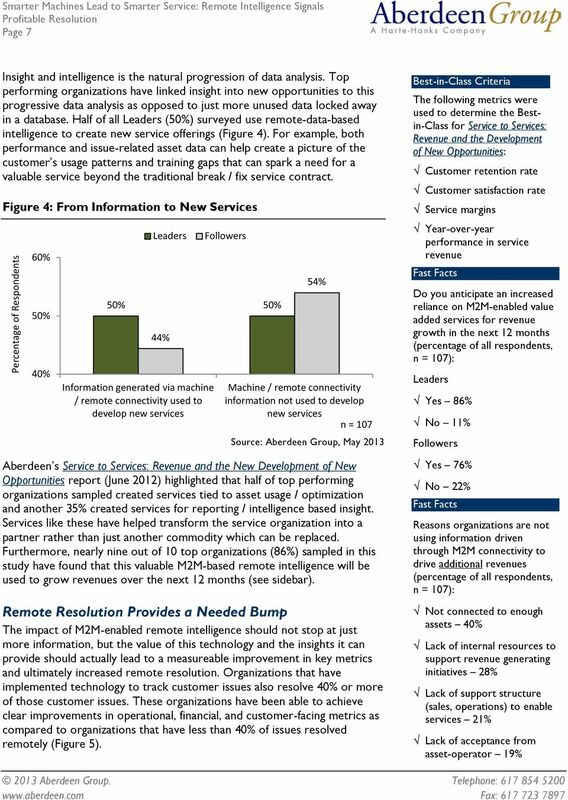 In Aberdeen s State of Service Management: Outlook for 2013 (January 2013) approximately one quarter of the Best-in-Class (24%) have prioritized remote service and smart services to support the service organization. This may seem like a small portion of the whole Best-in-Class pie; however this investment comes in conjunction with other initiatives to drive at capturing, communicating, and using data through technology investments in knowledge management and business intelligence (41% and 38% of the Bestin-Class, respectively). The added intelligence afforded from M2M and these other tools have enabled top performing organizations to outperform their peers in the use of this insight, which results in faster issue resolution, less downtime, and added customer value. This Analyst Insight will highlight some of the key trends in not only remotely monitoring assets and resources in the field, but also taking a closer look at why machine-tomachine data is integral to the service organization in regard to driving operational efficiency, service issue resolution, and increased profitability. August 2013 Analyst Insight Aberdeen s Insights provide the analyst s perspective on the research as drawn from an aggregated view of research surveys, interviews, and data analysis. Definitions M2M refers to machine-tomachine interactions from unmanned devices (e.g., HVAC and manufacturing systems, fleet monitoring, etc.) such as automated data streaming, alert triggering, and more. 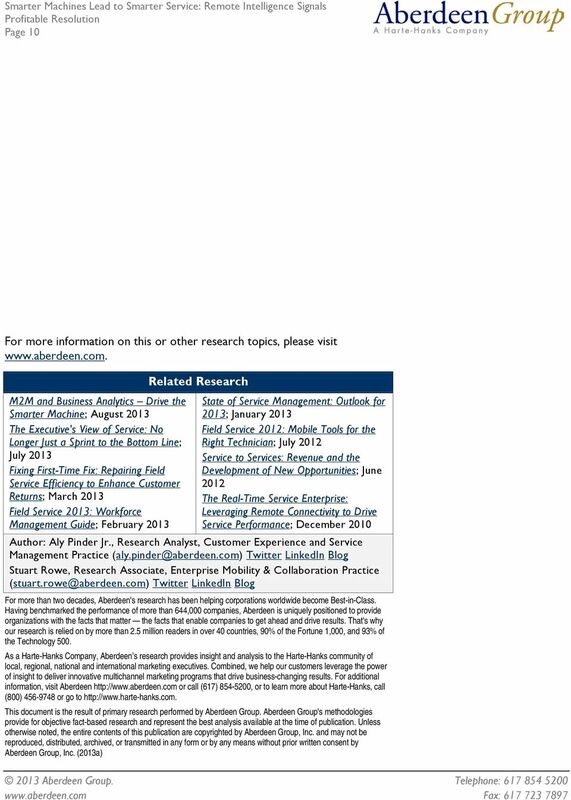 Remote Service is not in Full Control, Yet As M2M-enabled equipment becomes more common, the previous dearth of data and insight is being replaced with continuous data and actionable intelligence (see sidebar). The previous lack of remote connectivity with assets in the field has hindered many organizations in their ability to resolve issues without a truck roll or ensuring that customers can remain productive with assets that do not fail. With this ever increasing amount of continuously generated data, service organizations can leverage this data to spark innovations in predictive support and preventative maintenance models. 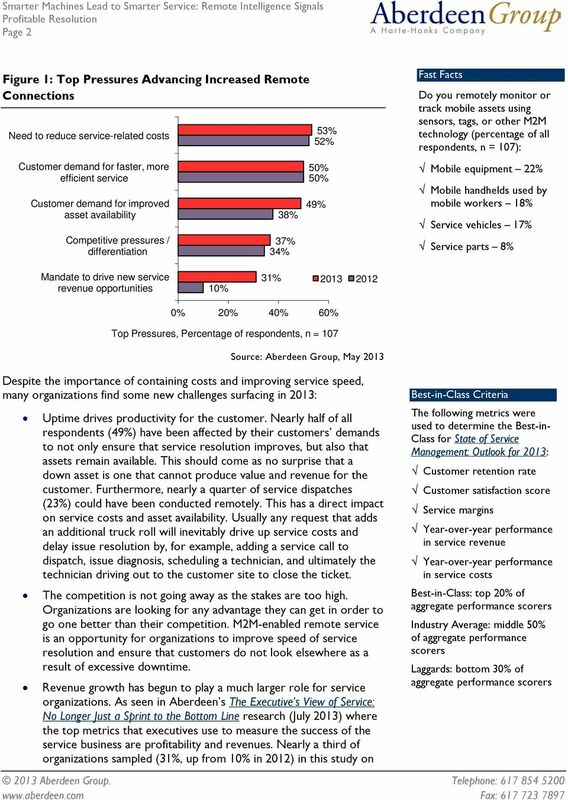 The top two pressures driving an increased use and interest in connected assets and remote-service capabilities are the need for service organizations to reduce costs while also improving the speed of serviceissue resolution for customers (Figure 1). 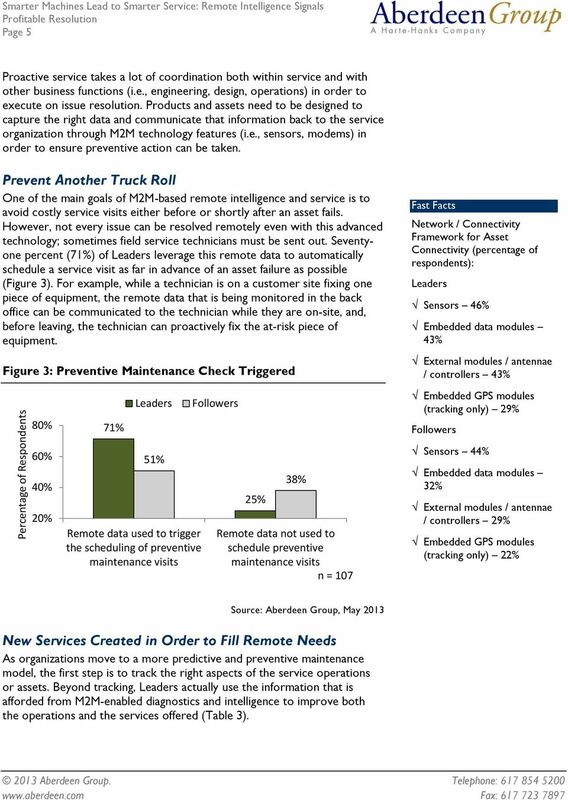 Percentage of serviceable equipment in the field remotely connected for purpose of asset management, tracking, service, and maintenance (percentage of all respondents, n = 107): Currently 35% In 12 Months 42% This document is the result of primary research performed by Aberdeen Group. Aberdeen Group's methodologies provide for objective fact-based research and represent the best analysis available at the time of publication. 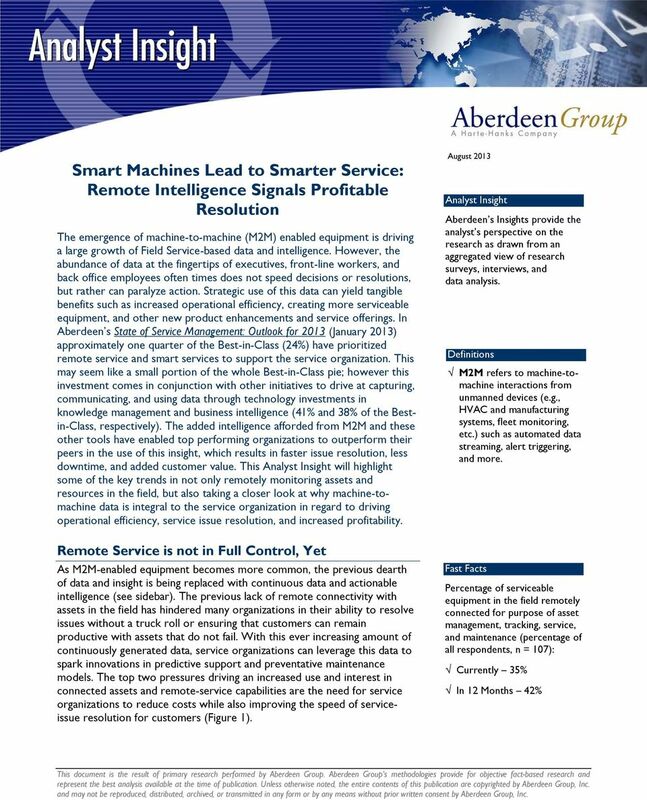 Unless otherwise noted, the entire contents of this publication are copyrighted by Aberdeen Group, Inc. and may not be reproduced, distributed, archived, or transmitted in any form or by any means without prior written consent by Aberdeen Group, Inc.
3 Page 3 remote service look to M2M technology as a means to increase revenue, which highlights alignment with the goals of senior management. Is Remote Control the Answer? The ability for service and manufacturing organizations to connect remotely to assets is not a new concept. Seventy-three percent (73%) of organizations sampled have some level of M2M connectivity with assets and resources in the field, with an additional 13% evaluating the use of enhanced technology to remotely connect to assets (Table 1). 26% of total annual service / maintenance issues currently are resolved remotely for all respondents 23% of total service dispatches are for issues that could be resolved remotely for all respondents Table 1: Remote Machines Are a Data Source Is Remote / Machine Connectivity Currently Leveraged Percentage of Respondents, n = 107 Using for more than 5 years 33% In use for 3 5 years 15% In use for 1 3 years 16% In use for less than a year 4% Currently in implementation 5% Not using, but evaluating 13% No plans to connect 13% Despite this relatively high level of adoption and general acceptance of M2M-enabled technology, only just over a third of serviceable equipment (35%) in the field is connected for the purpose of asset management, tracking, service, or maintenance (see sidebar on page 1). This disconnect between technology capability and actual value gained by M2M service data is a clear opportunity gap where top performing organizations have excelled, enabling better insight, performance, and issue resolution. The Real Impact of Remote Service on Determinants of Success The successful use of remote intelligence gleaned from field service and asset management affects a number of key operational, financial, and customer-facing metrics. 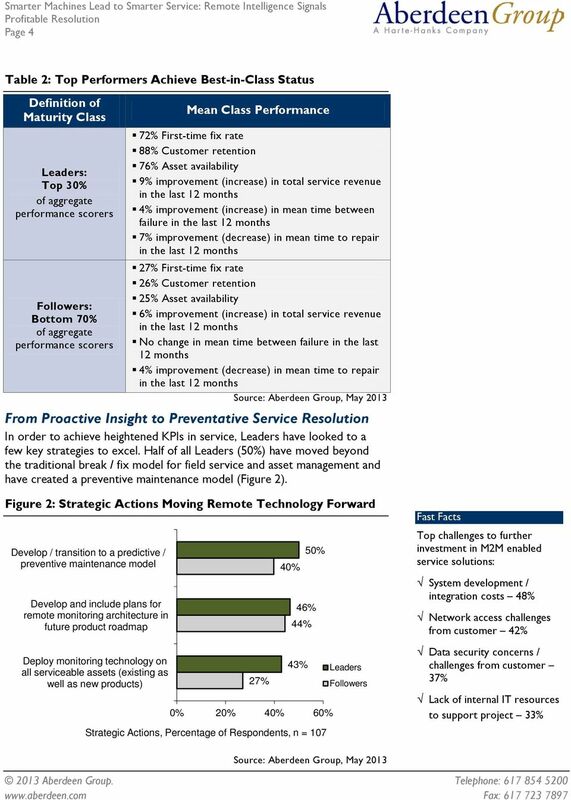 Top performing organizations () have outpaced their peers () in static and annual improvement KPIs as a result of effectively using M2M data from remote systems to resolve issues quicker and create new services which have in turn driven sustained revenues (Table 2). 5 Page 5 Proactive service takes a lot of coordination both within service and with other business functions (i.e., engineering, design, operations) in order to execute on issue resolution. Products and assets need to be designed to capture the right data and communicate that information back to the service organization through M2M technology features (i.e., sensors, modems) in order to ensure preventive action can be taken. Prevent Another Truck Roll One of the main goals of M2M-based remote intelligence and service is to avoid costly service visits either before or shortly after an asset fails. However, not every issue can be resolved remotely even with this advanced technology; sometimes field service technicians must be sent out. Seventyone percent (71%) of leverage this remote data to automatically schedule a service visit as far in advance of an asset failure as possible (Figure 3). For example, while a technician is on a customer site fixing one piece of equipment, the remote data that is being monitored in the back office can be communicated to the technician while they are on-site, and, before leaving, the technician can proactively fix the at-risk piece of equipment. Figure 3: Preventive Maintenance Check Triggered Network / Connectivity Framework for Asset Connectivity (percentage of respondents): Sensors 46% Embedded data modules 43% External modules / antennae / controllers 43% Percentage of Respondents 80% 60% 40% 20% 71% 51% Remote data used to trigger the scheduling of preventive maintenance visits 25% 38% Remote data not used to schedule preventive maintenance visits n = 107 Embedded GPS modules (tracking only) 29% Sensors 44% Embedded data modules 32% External modules / antennae / controllers 29% Embedded GPS modules (tracking only) 22% New Services Created in Order to Fill Remote Needs As organizations move to a more predictive and preventive maintenance model, the first step is to track the right aspects of the service operations or assets. Beyond tracking, actually use the information that is afforded from M2M-enabled diagnostics and intelligence to improve both the operations and the services offered (Table 3). 6 Page 6 Table 3: Remote Technology in Place Uses of Information Enabled via Machine / Remote Connectivity To alert service organization of asset failure / downtime Percentage of Respondents, n = % 54% To monitor condition of asset and its parts 61% 48% To monitor asset performance and output quality 61% 44% To inform field technicians of failure and recommend resolution scenarios prior to dispatch 50% 44% To monitor asset usage information 43% 35% To provide customer with self-service information To develop new revenue-specific service business models (pay per use, etc.) 43% 38% 36% 25% To improve design of product 36% 27% To improve security of asset 32% 21% To ensure timely / accurate invoicing or billing 32% 16% Proactive Notification M2M remote connectivity enables organizations with the ability to alert service teams of future failures or potential downtime. The earlier the service organization is made aware of a potential failure, the better prepared the team can be from a scheduling of resources or preventive maintenance perspective. Proactive Monitoring / Reporting M2M remote data provides insight into asset performance, output, and the condition of these valuable field assets. This reporting capability enables the service organization to better understand whether or not the customer is using assets / equipment appropriately and thus can take action to correct poor use. Proactive Product Improvements M2M data can be used by other business functions; from re-designing products to implementing new security features. Failure data is also valuable from proactively scheduling a service visit and this insight can be made available to engineering and design teams to improve the quality of current and future assets and parts. Proactive Service remote intelligence based on M2M data provides the opportunity to enable customers with self-service options through real-time issue diagnosis. This data can also provide the service organization with insight into new revenue opportunities based on the usage data captured in the field. 8 Page 8 Figure 5: Remote Resolution Spurs Revenue and Efficiency Average Result 60% 40% 20% >40% Remote Resolution <40% Remote Resolution 57% 54% 40% 38% 15% Analyst Note Definitions of Terms: Asset availability: (operating time minus downtime) / total operating time Mean time to repair: from notification of issue / failure to resolution 8% 3% 3% 0% Current Asset Availability Current First-time Fix Annual Improvement in Total Service Revenue Annual Improvement in Mean time to repair n = 107 These metrics have a clear impact on the organization as detailed in Aberdeen s Fixing First-Time Fix: Repairing Field Service Efficiency to Enhance Customer Returns report (March 2013). Ensuring that assets are up and running as quickly as possible has a direct impact on customer satisfaction and retention. Customers are the key to recurring revenue streams and positive referrals, and the impact of enhanced remote capabilities should not be overlooked in regard to strengthening the customer relationship. Key Takeaways M2M-powered remote technology and service has become more than just another trend. The benefits and opportunities afforded from remote intelligence have advanced beyond better reporting and are now at the heart of predictive and preventive issue resolution. Top performing organizations have taken advantage of these additional capabilities and a few lessons can be learned: Make collaboration more than a company buzzword. Many organizations strive for this utopia where walls between business functions fall and each group works as one with a singular goal in mind. Unfortunately, this is more difficult than expected. have been able to do a good job of collaborating with other functions like engineering, product development, and product design, however, ensuring that the valuable M2M remote data that is captured from the field migrates beyond the service team to aid in the improvement of current and future products still has room to grow (Figure 6). 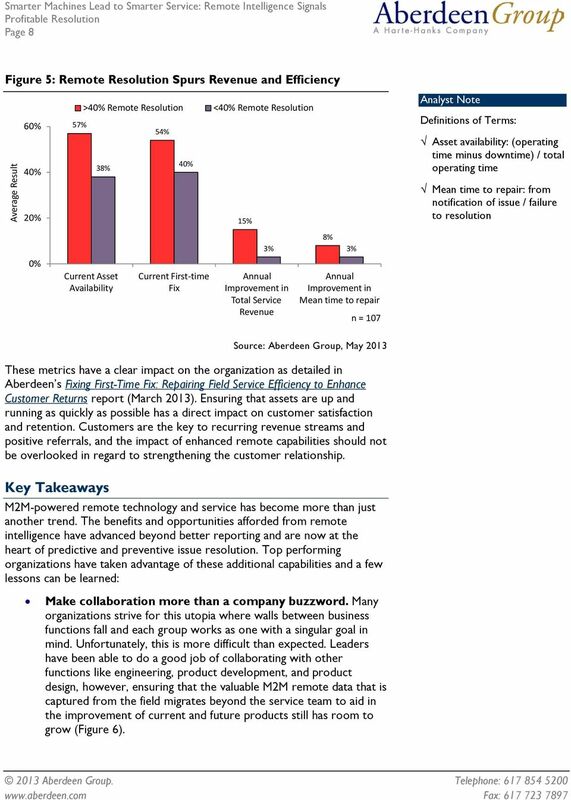 9 Page 9 Figure 6: Remote Collaboration with Other Internal Functions Percentage of Respondents 80% 70% 60% 50% 79% 65% Engineering 68% 51% Product development / strategy 57% 56% Product design n = 107 Use M2M intelligence to tailor new services to fit customer needs. Top performing organizations are not only using remote data to resolve more issues without a costly field visit, but also leverage this information to create more comprehensive service contracts, going beyond the usual break / fix offerings. The ability to link performance and usage to a service contract allows the service organization to charge the client for the customized level of production they require. The service organization, through usage and performance data, can also better understand the customer and create training opportunities to help these customers use their assets and equipment, as efficiently as intended. Explore the revenue opportunities of M2M-driven remote service. The revenue generating ability of service cannot go overstated. Even though products are becoming more and more commoditized in a competitive marketplace, organizations are installing more M2M intelligence capabilities in those products, parts, and assets to aid improved analytics (i.e., tracking, usage, failure). This additional insight can be used to shorten repair timelines, maintain remote assets, and alert the service team of usage trends. All of these benefits have the opportunity to be used to spur revenue streams driven by customer requirements for serviceability and asset uptime. 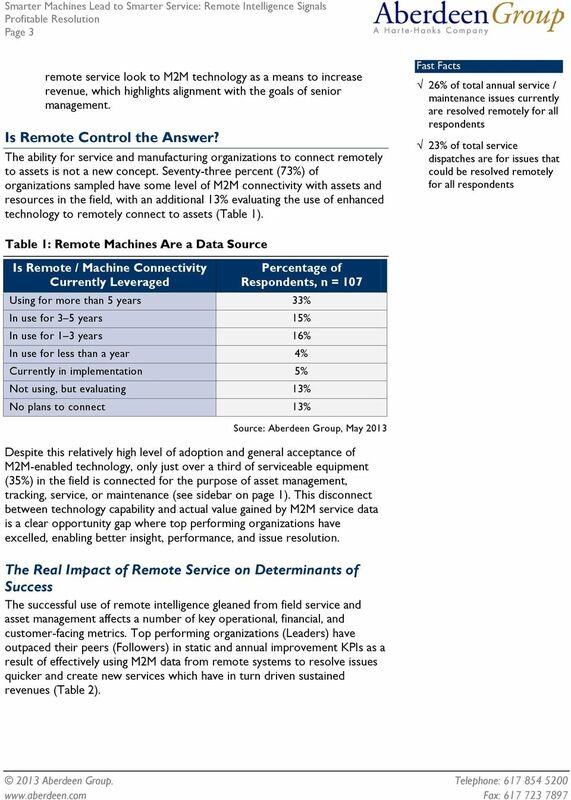 M2M-enabled remote service is not solely a monitoring tool (see Table 3 previously). Organizations that only use remote technology to find or monitor a dot on a map miss out on a great opportunity to unearth the value of M2M intelligence. Top performing organizations maximize the power of remote intelligence to track, monitor, manage, report, and resolve asset issues throughout the service lifecycle. WHAT DO YOU MEAN END-TO-END FIELD SERVICE MANAGEMENT? Field Service 2011: Mobility and the Extension of the Service Enterprise. July 2011 Sumair Dutta, Aly Pinder, Jr.
Field Service 2012. The Right Technician. February 2012 Sumair Dutta, Aly Pinder, Jr.
Astea Whitepaper: Optimize Field Service With Automated Scheduling and Dispatch Optimize Field Service With Automated Scheduling and Dispatch WHITEPAPER 1 Introduction Field service is a dynamic environment. Achieve greater efficiency in asset management by managing all your asset types on a single platform. ASSESS. PLAN. OPTIMIZE. Contact Center TotalCare Enhanced Services The Exceptional Customer Experience Customers have more options than ever and retaining or losing valued business is often a click away.